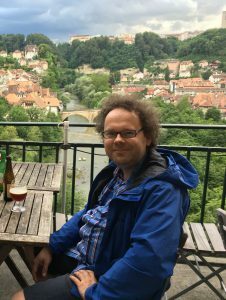 Fabian Dorsch died suddenly on 21st February, 2017. Though his interests in philosophy were very broad, philosophical aesthetics was always close to Fabian’s heart. He wrote a doctoral thesis on imagination at University College London (2005), before moving to the University of Fribourg, where he was Associate Research Professor at his untimely death. In 2008 Fabian more or less single-handedly founded the European Society of Aesthetics, and as its first Secretary nurtured it through its early years. In 2012 he became Editor-in-chief of Estetika, deploying his boundless energy and good judgement to raise its international profile. He had a fertile and creative philosophical mind, and leaves an important body of published work on imagination, depiction, perception, the normative role of experience, and the role of reasons in aesthetics. Fabian’s generosity and warmth; infectious enthusiasm for all that he loved – especially philosophy; and his probing but always constructive responses to any idea put before him will be much missed.